Oumi Watch, Glasses and Jewelry School in Shiga Prefecture, Japan, has trained young graduates to be watchmakers since 1976. Their new session starts in April of 2003, and registration is taking place now. The school has the 3 courses – “Watch, Glasses and Jewelry”, “Watch and Jewelry”, “Glasses and Jewelry”. Each course accepts only 20 students and lasts three years. Some of the watch subjects thought include Mechanical, Electronic, Quartz, Disassembling and assembling, Timing, Escapement, and Horological History. Oumi Watch, Glasses and Jewelry School is affiliated with the Oumi Shrine, which is dedicated to the Tenji Emperor who started the modern time system in Japan. 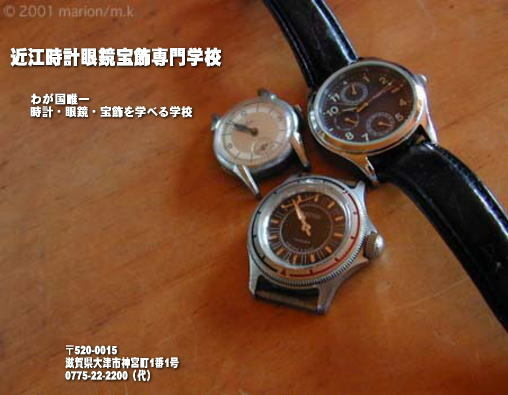 At the Oumi Shrine there is a Watch Museum where some 3,000 items related to watches from all over the world are exhibited. The Truth Behind Michael Kobold & the Kobold Watch Co.